One of the ways to stay updated in your field is to read a lot and follow the most popular sites in your niche. In this way, you will be able to find useful resources, read about news and discover trending topics to write about on your own blog. Then I am sure you are already following your favorite websites, may be via RSS Feeds, or just bookmarking them and visiting the URL occasionally. If you are in the internet marketing or blogging niche, there is a juicy new resource that you may want to check. This new site is Bloggerscope, you can find new connections or even discover your next favorite blogs here! Bloggerscope is an aggregator site with the most popular marketing and blogging posts, coming from the authority sites, like Social Media Examiner, Copyblogger, Quick Sprout or Socialmouths, just to mention a few ones. In the first page, you will see the last posts, published in the time you have set – today, yesterday, last 3, 7 or 14 days. You can sort the posts by date, shares or popularity. If you sort the posts for popularity, you can check at first glance which are the articles that you do not want to miss. That’s a great way to stay updated, even without investing a big part of your day. You may decide to visit Bloggerscope once a day, or once a week. The site is pretty new, but it already includes most of the popular sites in the marketing and blogging niche. In the menu above of the site, if you switch from “Top Posts” to “Top Blogs”, you will have under your eyes the most popular sites, ranked depending on Alexa, Twitter followers, DA – Domain Authority, MR – MozRank and SA – Social authority. You can see Problogger in the first page, Chris Brogan site, Viperchill, Kikolani,John Paul Aguiar and Reviewz N Tips of my friend Daniel Sharkov, among many others. If you click on a blog name, you will be redirected to the last posts of this site, ordered with the metrics mentioned above. This is also a pretty fast way to check the last most popular posts of a particular blog you like or you follow. This is once again a method to save time when you need to choose which articles to read. – find new connections and meet new bloggers. Whether you want to read the most popular marketing posts of the week or you want to find new ideas for your next article, I suggest you to take a look at Bloggerscope. The system is currently tracking 65 of the most influential marketing blogs and if you feel your site should be included in this useful resource, you may submit your URL here. Have you already heard of Bloggerscope? Are you going to join the site? Please let me have your thoughts in the comments below, thanks! Erik, awesome list man! Exactly what I have been looking for as I expand my blogging network. I just found scoop.it yesterday. This is like scoop.it on steroids it seems to me. Bookmarking and heading over now. What a neat way to meet friends, learn from the pros and grow your blogging audience. I have joined Scoop.it a couple of years ago, I have read about it at first on Ms.Ileane’s blog. Good to know you found this article useful! 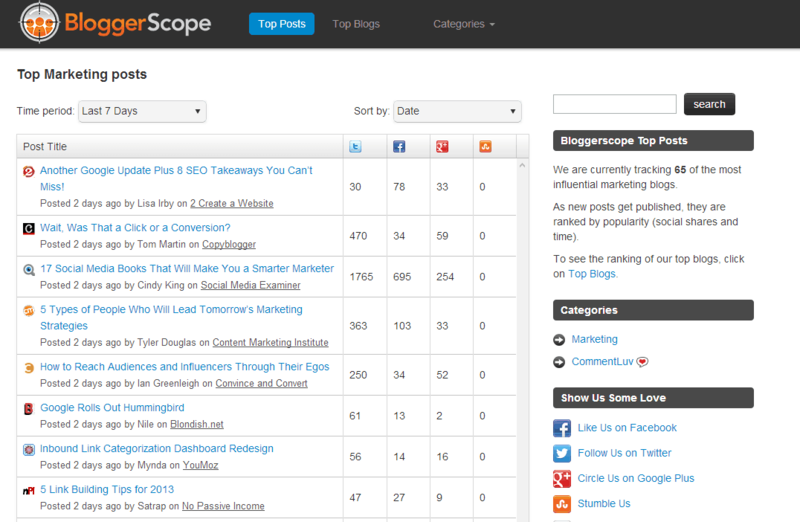 Thanks for this post Erik, I have never really looked into Bloggerscope.com. I think I have read about it before, but it seems as it is a really good resource to use for bloggers. You should take a look at it, Apollo. That’s an interesting place for internet marketers. I know bloggerscope for a while but i’ve never have time to try. i think this is a very useful tool for bloggers, especially newbie. thanks for your detail article. can’t wait to use it. Thanks for the feedback, Stephan. I think you should take a look to bloggerScope. LOL Found this on BloggerScope. This means that BloggerScope really works. Bloggerscope is a GREAT place to discover content. I visit the site daily to catch up with my reading and also to discover interesting sites where I can connect with new bloggers via commenting. I share with you the same usage of BloggerScope, Jane. Other than reading the most popular posts in the marketing and blogging niche, I have found many sites I have never heard about. I checked out bloggerscope and i was impressed with the idea . Bloggerscope has got a lot of interesting posts to go through .I think , i can make some new connections through bloggerscope too . Thanks for sharing the information on bloggerscope mate . I am glad you found the post interesting. 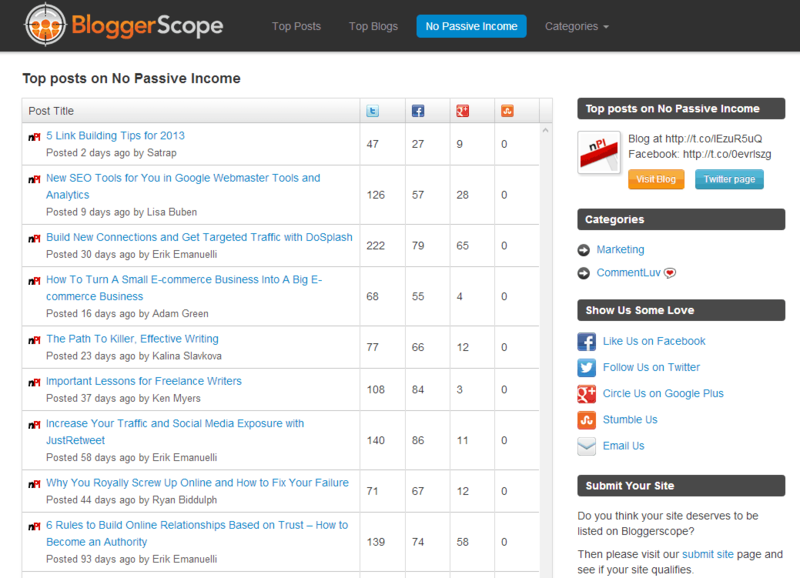 Hi Erik, thanks for posting this, i just heard of Bloggerscope here now, i appreciate. I will go right away to test it. Is this similar to NetworkedBlogs? I have never checked NetworkedBlogs. Thanks for mention that, Lynell. Thanks Erik for revealing the site Bloggerscope. It is a good resource for all bloggers. The way it has been designed is really easy to get what exactly you want. I guess it’s kinda community for bloggers and to be honest I wasn’t ware of it. I’ve been using BloggerScope for a long time, then stopped. Recently I checked it out again, but it’s not working anymore… Did they shut down their project or hopefully working on improving it? Would love to know, it was a great tool. I noticed that too, few weeks ago. I see “Top blogs” is still there. I guess the project wasn’t profitable, if development stopped. Thanks for visiting and commenting, Liudas.